Double J Animal Hospital is a full-service veterinary hospital providing compassionate health care for large and small animals. 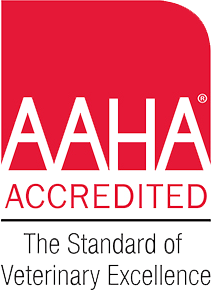 Our state-of-the-art hospital, which was accredited by the American Animal Hospital Association (AAHA) in 2018, is located at 2804 S. Eunice Highway in Hobbs, New Mexico. From Hobbs, go south on Dal Paso one mile past the MLK soccer complex. We are on the east side of the road, before you reach the west by-pass. Look for our giant windmill! Call us at (575) 738-0143 to schedule your appointment. At Double J Animal Hospital, we love them all . . . big and small! At Double J Animal Hospital, LLC, we treat your pets like the valued family members they are. After graduating from Hobbs High School and Texas Tech University, Mark Justice moved to Fort Collins, Colorado, to attend veterinary school at Colorado State University. Upon graduation in 1999, Dr. Mark moved to Levelland, Texas, and worked in a mixed animal practice as an Associate Veterinarian for a year and a half. Dr. Kyra Perry graduated from Seminole High School in Seminole, TX. After finishing her undergraduate studies at West Texas A & M in Canyon, TX, she relocated to College Station to attend veterinary school at Texas A & M University. Upon graduation, she and her husband moved to Hobbs. Dr. Kyra looks forward to working in the southeast New Mexico and west Texas areas. She enjoys helping both large and small animals. "We have been going to Double J for many years. Dr. Mark is our primary vet and he treats all of our animals. He takes the time to answer our questions and we have always received exceptional care. He also got us through a very precarious sitaution involving a Black Widow spider bite on one of our dogs. We would highly recommend Double J!" "The entire staff at Double J Animal Hospital is amazing. Everyone is so caring and compassionate. I know that all of my fur babies are well taken care of when in their care. Best animal hospital in Hobbs!" "Took awesome care of my dog. I view our pets more like family, and they took excellent care and kept me updated with everything. They discussed treatment before proceeding. Love it! All my babies will go here." "Dr. Mark and his staff at Double J are amazing! They have the utmost respect for you and your pet and treat you both like family. I have seen a lot of vets over the years, and none can compare to those at Double J. They truly believe that pets are family members and it shows in the care they provide." "The most sincere, kind, and patient doctors and staff that I have ever encountered! A beautiful, clean facility. Great communication and follow up with patients and owners!" "We have three German Shephards and Double J has taken care of our animals for the last five years. No problems at all and we would highly recommend this vet and kennel service." "Top notch care from compassionate and friendly staff! You and your pets will love this place!" "Thank you all for taking such great care of Jameson. He traveled with me to several different vets across the country. You have been, by far, the absolute best vet we have been to. We are so lucky to know that Moose and Jager are going to be well taken care of. Thank you again for everything!" "We can’t thank you enough for all the love and attention you gave Bob! He is as good as new and we can’t begin to tell you how grateful we are to have him back. We will definitely be seeing you in the near future for all of our other animals needs." "Thank you so much for bringing our Chilly back to us. We thought we had lost her, but your excellent, tireless care, along with yourprayers, saved her. Words cannot express our appreciation for everything you did for the smallest member of our family." "Thank you for taking such good care of Betty and for making her visit so fun. Your office and staff are amazing! We sure are glad you came to Hobbs!" our hearts. Thank you for the gentle compassion you showed to Peppy and our whole family. You to have the bedside manner of true saints." "Thank you for taking care of Winchester. We appreciate that he was treated like a member of your family!"